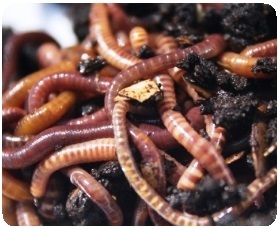 Worm farming is called vermiculture or vermicomposting (from Old English wurm or wyrm). Not that the wormies care a scrap, they just want your scraps. The humble worm will chomp its way through material many times its own weight and process it into rich castings. Worms are a great alternative to composting if you live in a unit or townhouse and produce mostly kitchen scraps. It's a good deal... your Red Wiggler worms get free board and food, and you get kitchen waste turned into usable garden material... not to mention thousands of devoted pink pets. For sheer greedy guts the Red Wiggler worms (Eisenia fetida) take the cake. Also called Tiger worms, manure worms or Brandling worms, they process food faster, tolerate more conditions and breed faster than the next best worms, European Nightcrawlers or Dendras (Eisenia hortensis). Both worm varieties can happily co-exist. Red Wigglers live in the top layers of material only. If you tip some into your garden or compost they will not survive if they have to stay in your garden and burrow down. The Lob worms or soil-dwelling earthworms are different. These garden worms like to burrow way down and are the worms that you will find amongst your garden soil and deep in your compost pile, because they have migrated up from the ground after the hot composting process has cooled down. Lob worms are best at aerating the soil by tunnelling, and conditioning soil by producing worm castings from bacteria and algae in sandy or clay soils. They are rather slow coaches at processing scraps and plant material. Building your own is quite feasible, although with a homemade wormery it can be a hassle getting the finished material separated from the new. I was given a worm farm recently and have been really impressed with the results. They're not expensive and they will last almost forever. Follow the instructions for setting it up and getting it started. Otherwise you will need a lidded tub or container, preferably large and flat and not too deep. Plastic is mostly used and sometimes wood, often lined with metal or plastic. You need a drainage hole in the bottom of the bin which sits over another flat container or tray which the leachate drains into. The container must not be airtight, allow some gaps or make a few very small holes in sides or lid. Rats, mice and others DON'T need entranceways into your worm composter. There are so many plans and examples around... have a look and work out what's best for you. For a family of 4, a very large bin or two bins of about 60cm square (2ft) would be good. Any shape, round or oblong of similar capacity is fine. This size would take at least 1kg (2lbs) worms who would happily process roughly 9 kg (20lbs) of organic material per week. Fine dining to worms is shredded paper — newspaper, brown paper, tissue paper or old tax returns — put it all to good use. Dampen this first and make a thick bedding layer of at least ¾ full. Leaves, old cut grass, dead moss and other plant materials will all be welcome to start off your worm composting, just make sure it is damp. Worms need a moist environment to be able to move through and munch happily. Now you add your scraps and tip in your worms. Soil or compost is not needed, but if there is some with the worms it can all go in. Worms can be bought online or at garden shops, or find a friend with spare compost worms like I did. You also may find some in the top layers of your own compost pile or ask a local farmer if you can inspect some old piles of manure that have been covered with dried grass or hay. Lift up the covering and lo and behold. What are the Best Conditions for Worm Composting? Worms don't like heat or cold... between 45-80F (7-26.5C) will suit them fine. If possible, insulate their home if temperatures are outside that range, or bring your worm farm indoors. Worms will slow down and not be so active or eat so much in the colder weather, so you may need to reduce your scrap offerings. Vermicomposting is not like ordinary composting. You want your worms to process the scraps you give them, whereas with hot compost, heat is generated to break down the large pile of material. Therefore only give your worms thin layers of scraps and preferably in small chunky bits. Worms don't actually start dining on your offerings until they have been semi-softened and slightly decayed by other bacteria and fungi, so small scraps mean more surface area for bacteria and fungi to break it all down. They will process at least half their own weight in food each day. Fruits: All fruits, peelings and cores of apples and pears; stone fruits like peaches and plums; berries, particularly strawberries; melons and bananas. Citrus fruits and peels will usually be snubbed by your worms and they can be poisoned by the chemical, limonene, if they eat more than a small amount of citrus. The odd grapefruit, lemon or orange skin won't hurt. Vegetables: No need to cajole your worms to eat their veggies, they'll wolf down all and anything... peelings and stalks, pods and cobs, leaves, seeds and flowers; all shapes and colours. Go easy with onions and family, spices such as ginger and chillies, and too many potato peelings. 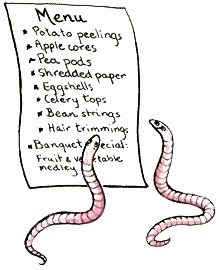 Worms take their time processing these foods, and you don't want to have strong fumes coming from your vermicomposter. Grains: Your leftover porridge, cereals, muesli, rice, pasta and bread are all fine, preferably not too sugary. Cake, biscuits and sometimes bread products can attract bad molds, ants and red mites, so keep these in moderation and check regularly and remove if necessary. What else? Toss in your teabags, coffee filters (small amounts of coffee grounds only as they are a bit acidic), newspaper and other paper (unshiny) cardboard and old flower arrangements. Other garden material such as old leaves, moss, small handfuls of weeds and grass, and other thin or shredded organic flora. Eggshells are excellent and provide the grit that toothless worms need to help them take in their food. Avoid: Animal products such as meat, fish, dairy, and pet droppings. Although worms will eat these, it's best not to put them in your worm composter because of possible disease contamination; plus the smell will attract vermin, flies and other opportunistic pests. 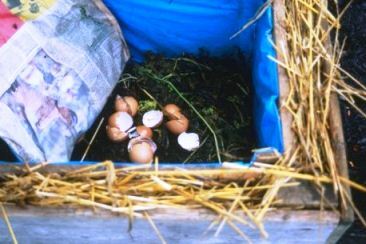 Place the food on top of your worm farm, then cover with shredded paper, cardboard, straw, carpet, sacking... in fact any or all of these and other natural materials that are have been dampened. It will all eventually get eaten. Or put the food just under this covering layer if there is plenty there that hasn't been processed yet. Just don't mix the food up with the finished worm castings. Keeping the scraps covered deters fruit flies, midges etc and keeps the environment dark and damp — just what your pink pets wuv. There are no clocks in wormland. Life is one big nosh-up. Put in your scraps and stuff each day, once a week — whatever suits you. If you leave them for over a month, you should get someone to check and make sure they have enough food and moisture, and they haven't suddenly got blaring sun heating them up. If you lift the lid and the top walls and lid are covered in worms, this means the environment is wrong. Too wet... put in dry bedding such as shredded paper etc. Too dry... duh — add some water. Your neighbours have locked themselves in their homes? An overpowering odour from your worm composter means mouldy, uneaten food needs to be removed. If you can buy rock dust or crushed oyster shells, this will help when you sprinkle it over the top. Also, always cover the food with a damp covering, like cardboard, sacking, paper, piece of carpet, mat or similar, before putting the lid back on. Leachate is the liquid that trickles slowly from the bottom of your worm composter. I swear plants give a frisson of joy when they see me come near with a watering can of diluted worm juice. Dilute approximately 1 to 10 with water and feed roughly each week to fast growing plants in spring and summer, and every 3 weeks for larger slow growing plants. Worm Tea is made by soaking worm castings is water to extract the nutrients. See How to make compost tea for exact instructions to make worm tea. Worm Castings are excellent fertilizer to sprinkle over your garden any time. 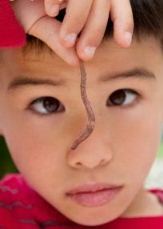 Worm farming fascinates children. Encouraging children to care for their own worm farm is a fun way to learn all about one of nature's cycles of life. See here for more ideas on Gardening for Kids.